Marton Primary has recently taken part in a competition to help raise money for young carers in the area. 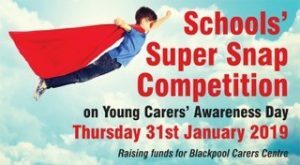 31st January was ‘Young Carers’Awareness Day’ and schools all over the region were invited to take part in the event, to raise funds and promote the great work of Blackpool carers. “Hats off” – as we admire young carers, plus young carers wear many different hats in one day. There are around 10,000 young carers in the UK, between the ages of five and seven, according to the most recent Census. More than 80% of them are carrying out caring duties every day or most days of the week. Blackpool Carers’ Centre staff and mascot will choose the most creative photograph submitted as the winner. There’s a trophy up for grabs, but most importantly, funds and awareness were raised.